At Deputy and Xero, we are committed to helping our customers increase their awareness of trustworthy resources that can help them keep track of pending changes and ensure they’re complying with any new mandates that could affect their businesses. Restaurant and retail employees work in a world where schedules are predictably unpredictable. For Americans who work traditional nine-to-five jobs, the life of a worker with a constantly-changing shift schedule can be difficult to fathom. It’s common for employees to report for work and then be sent home early because business is slow, or have their shifts canceled with short notice, leaving employees wondering how they might pay their bills. This has sparked a new trend in the world of shift workers. Many states and cities have now adopted predictive scheduling laws. These laws are meant to protect the work-life balance and financial stability of employees through fair and advanced scheduling practices. To date, the movement toward predictability involves only a handful of states, but it’s expected to expand to other areas in the future. Will your business be prepared? 1. What is Predictive Scheduling? 2. What are the main sections of the new Fair Workweek Laws? 3. When & where are these laws in effect? 4. Who does this law effect? 5. Does the law apply to employers that are not based in New York City? 6. Are workers who are hired by other companies to perform work at a retail business or fast food establishment covered by the law? 7. Who is considered a fast food employee? 8. What are the rights of employees in the fast food industry? 9. Who is considered a retail employee? 10. What are the rights of employees in the retail industry? 11. Which fast food employers does the law cover? 12. What is a fast food establishment? 13. Which retail employers does the law cover? 14. If a retail employer’s total number of employees varies—sometimes more than 20 workers and sometimes fewer—is the employer required to follow the law? 15. How does this impact employers? 16. What can employers do? 17. Are your clients compliant? 18. Who enforces the Fair Workweek Law? 19. What happens if an employer violates the law? 20. What types of fines could covered employers pay for violating the law? 21. How can fast food and retail stores manage these more complex regulations? What are the main sections of the new Fair Workweek Laws? Advance Scheduling and Schedule Change Premiums: This section requires fast food employers to provide a written Good Faith Estimate of the days, times, locations, and total number of hours that a fast food worker can expect to work each week; 14 days’ (2 weeks’) notice of work schedules to fast food workers; and schedule change premiums when schedules are changed with less than 14 days’ notice. Minimum Time between Shifts: This section requires that a fast food worker consent in writing before being scheduled to work or working two (2) shifts over two (2) calendar days when the first shift ends a day and there are less than 11 hours between shifts. These shifts, known as “clopenings,” usually involve both closing and opening the establishment. The fast food employer must pay the fast food worker a $100 premium for working a clopening shift. Importantly, an employer is not required to pay an employee the additional $100 if that employee voluntarily consents or requests in writing to work the “clopening” shift. Access to Hours: This section requires fast food employers to offer any new shifts to existing workers at the location where shifts are available, followed by existing workers from other worksites before advertising new shifts externally or hiring a new employee. If existing workers do not accept open shifts, employers may then advertise for new workers. On-Call Scheduling: This section bans retail employers from scheduling on-call shifts and requires retail businesses to provide 72 hours’ (3 days’) advance notice of work schedules to retail workers. Contributions to Nonprofits: This section provides fast food employees the ability to make voluntary contributions to a nonprofit organization through payroll deductions. The employer must receive a registration letter from the nonprofit and written authorization from the employee. When & where are these laws in effect? On November 26, 2017, New York City’s Fair Workweek Law went into effect. 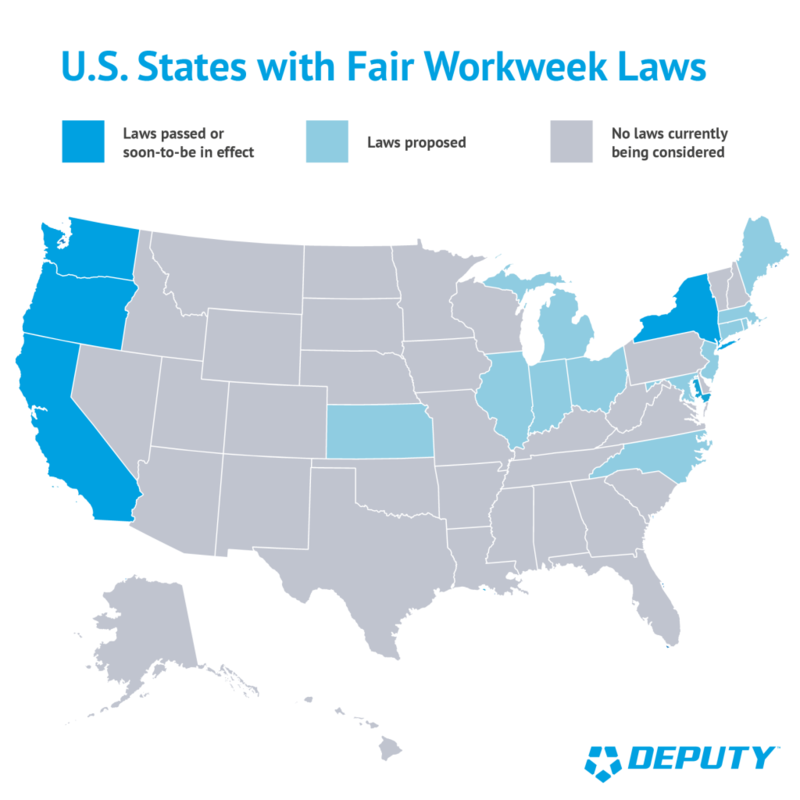 Oregon, Seattle, San Francisco, Emeryville (California) and New York City are the only cities that have Fair Workweek legislation live. Many more cities and states are working on legislation or considering bills such as: California, Connecticut, the District of Columbia, Illinois, Indiana, Kansas, Maine, Maryland, Massachusetts, Michigan, New Jersey, New York, North Carolina, Ohio, and Rhode Island. Each law has its own particulars, so it’s important that employers study the rules of their state or city. Who does this law affect? Does the law apply to employers that are not based in New York City? Yes. The law applies to all employers that fit the definition of a retail or fast food employer and that employ workers in New York City. The employer can be based outside of New York City. For example, a national fast food or retail chain’s establishments in New York City will be covered if they otherwise meet the requirements. Does the new law apply to all retailers? No. 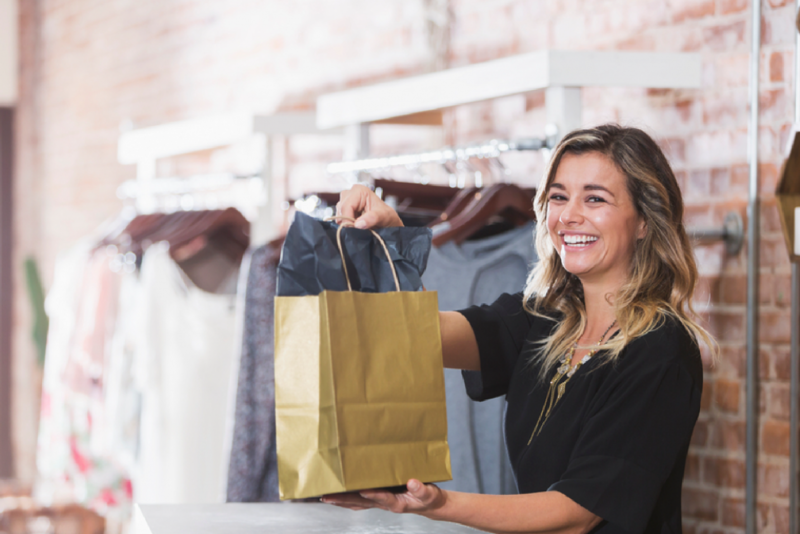 The law applies to “retail businesses” which are defined as entities with 20 or more employees engaged primarily in the sale of consumer goods at one or more stores within New York City. Are workers who are hired by other companies to perform work at a retail business or fast food establishment covered by the law? Yes. Even if workers are hired by a subcontractor, temp firm, or another third party to work at a retail business or fast food establishment, they are covered by the law as long as they meet the definition of a retail or fast food employee. Who is considered a fast food employee? What are the rights of employees in the fast food industry? Good Faith Estimate of Schedule: On or before workers’ first day of work, employers must provide written schedules for the first two weeks of work with hours, dates, start and end times of shifts and written “Good Faith Estimates.” Employers must provide an updated estimate if the estimate changes. Advanced Notice of Work Schedules: Employers must give workers their written work schedule at least 14 days before their first shift in the schedule. Priority to Work Newly Available Shifts: Before hiring a new employee when new shifts become available, employers must advertise shifts to existing workers in New York City first by: 1) posting information at the worksite where the shifts have become available and by directly providing the information to workers electronically, which may include text or email; 2) giving priority to work open shifts to workers at the worksite where shifts are available; 3) giving shifts to interested workers from other worksites only when no or not enough workers from the worksite accept. Employers can only hire new workers if no current New York City workers accept the shifts by the posted deadline. Consent Plus $100 for “Clopening” Shifts: Employers cannot schedule workers to work two shifts over two days when the first shift ends a day and when there are less than 11 hours between shifts (a “clopening”) UNLESS workers consent in writing AND are paid a $100 premium to work the shift. Who is considered a retail employee? All employees of a retail employer are covered regardless of position or job title. There is no exception for supervisors or managers. Exception: The law does not apply to any retail employee covered by a collective bargaining agreement in which the rights under the law are expressly waived and employee scheduling is addressed. What are the rights of employees in the retail industry? 72 Hours’ Advance Notice of Work Schedule: Employers must give workers their written work schedule at least 72 hours before the start of the schedule in the way the employer usually contacts workers, which may include text and email. They must post the schedule at the workplace where all workers can see it. This schedule must include dates, shift start and end times, and location(s) of all shifts in the work schedule. If the schedule is changed, employers must update and repost the schedule and contact all affected workers. No On-call Shifts: Employers cannot require workers to be ready and available to work at any time the employer demands, regardless of whether workers actually work or report to work; or to “check in” within 72 hours of a scheduled shift to find out if they should report for the shift. No Shift Additions with Less than 72 Hours’ Notice: If employers want to add time or shifts to employee schedules less than 72 hours before the change, workers have the right to accept or decline the change. If workers accept an additional shift, they must do so in writing. No Shift Cancellations with Less than 72 Hours’ Notice: Employers cannot cancel a shift less than 72 hours before the start of the shift except under the following circumstances: threats to worker safety or employer property, public utility failure, shutdown of public transportation, fire, flood, or other natural disasters, or a government-declared state of emergency. However, workers may trade shifts voluntarily. Which fast food employers does the law cover? Fast food employers are employers who hire fast food employees to work at fast food establishments. What is a fast food establishment? A fast food establishment is a business that is part of a chain, primarily serves food and beverages, offers limited service, and is one of 30 or more such establishments nationally (including both corporately owned locations and franchises). Fast food establishments located within other types of establishments, such as food courts in a mall or airport, may also be covered by the law. Which retail employers does the law cover? Retail employers employ retail workers at retail businesses. A retail business primarily sells consumer goods to the public at one or more stores in New York City and employs 20 or more workers in New York City. If a retail employer’s total number of employees varies—sometimes more than 20 workers and sometimes fewer—is the employer required to follow the law? If the number of employees working for an employer changes, the employer should use the average number of employees who worked per week during the previous calendar year to determine if it is a covered employer. Employees include part-time, temporary, and seasonal workers. Read this blog for real-life examples of lawsuits and how Deputy is helping our customers solve for these issues. Stop “clopenings” — employees must have 11 hours off between shifts. The Fair Workweek Law presents significant burdens to the scheduling and recordkeeping requirements of fast food and retail employers. Clients in the fast food and retail industries must retain electronic records documenting their compliance with the requirements of the Fair Workweek Law. 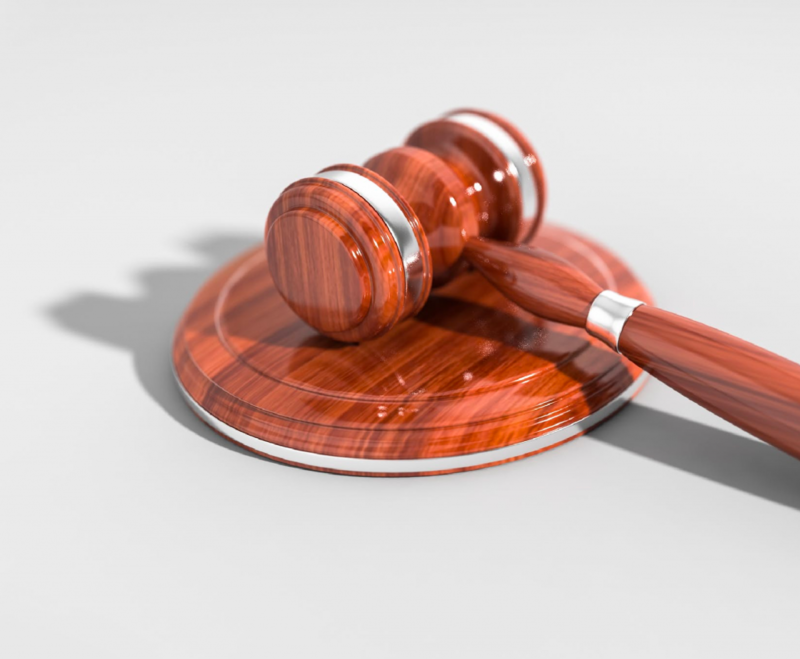 A FLSA prosecution means you’ll be paying back wages, penalties, and your own legal fees, as well as paying your employees’ legal fees. Violations of wage and hour laws are one of the largest risks employers face. Who enforces the Fair Workweek Law? Find out more about the Fair Workweek Law and other workplace laws. Get a referral for other resources to protect and enforce their rights under the Fair Workweek Law. What happens if an employer violates the law? 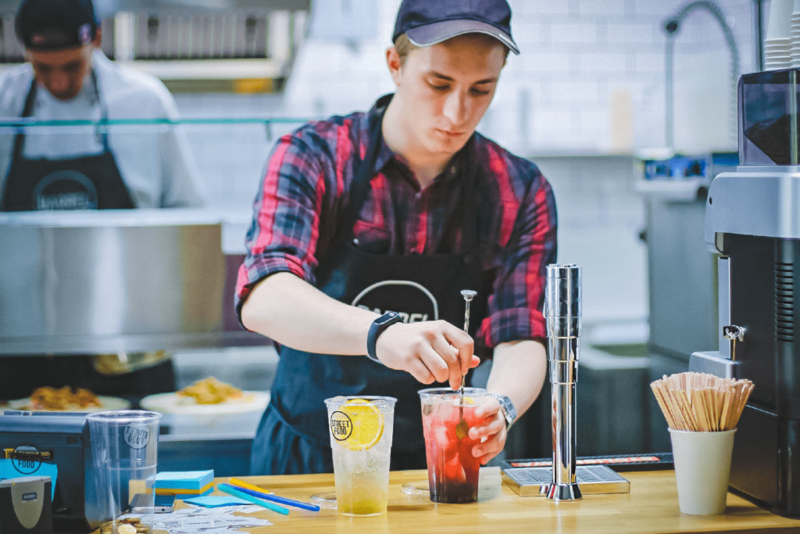 Retail or fast food workers may be entitled to damages, additional payments, and other relief to remedy the harm done to them and any failure by an employer to comply with the law. What types of fines could covered employers pay for violating the law? Under the new laws, fast food employers must provide an estimate in writing that sets forth the number of hours that the employee will be working per week for the duration of their employment. If this work schedule changes, the employer must provide at least 14 days’ notice. The law also specifies that employers must pay a premium ranging from $10 to $20 for each change to the work schedule made by the employer within 7-14 days’ notice. If the employer makes changes to the employee’s work schedule with less than 7 days’ notice, they must pay a premium ranging from $15 to $45. If the changes are made with less than 24 hours’ notice, the employer must be paid a premium of $75. So, how can fast food and retail stores manage these more complex regulations without obstructing the workflow? 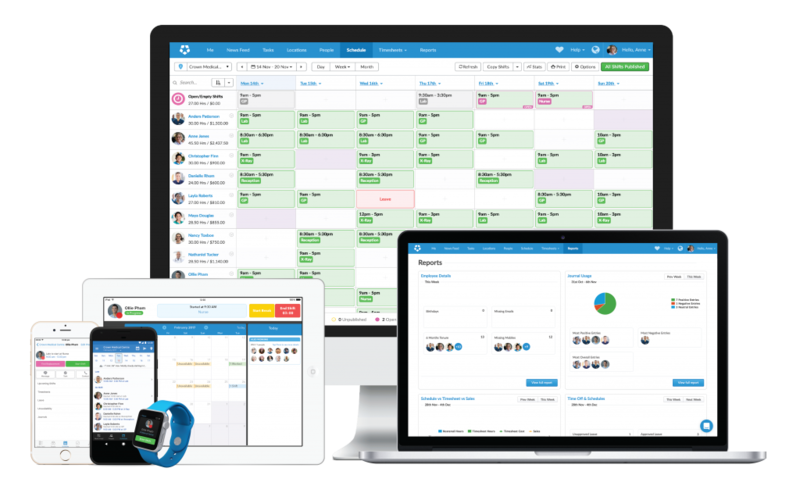 The most efficient way is to partner with a workforce management software platform that is up-to-date and stays in compliance with new predictive scheduling laws no matter what state you’re in. 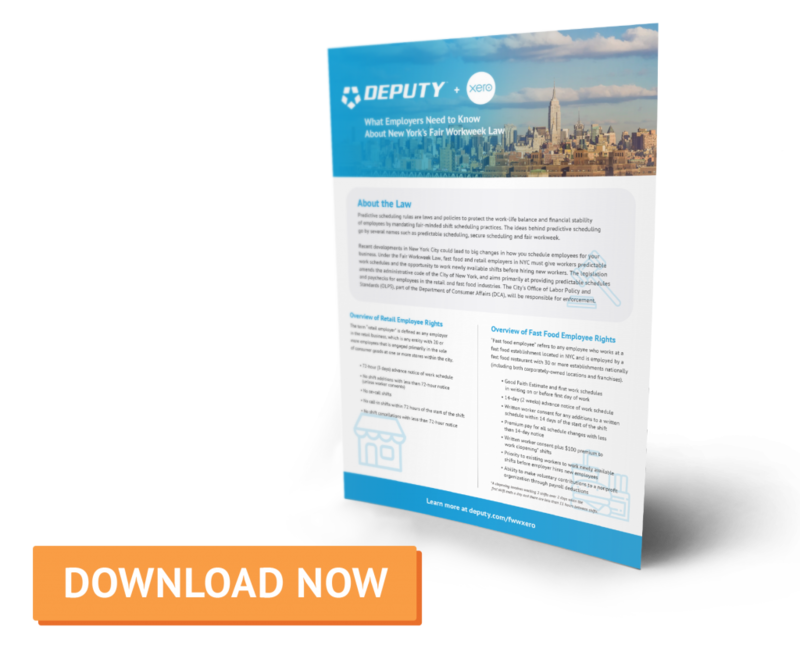 Deputy handles complex compliance laws that other workforce management software cannot. The post Predictive Scheduling: What accountants, bookkeepers & consultants need to know – Deputy + Xero appeared first on Deputy.